Barbados is a treasure trove of tropical wildlife. Visitors will enjoy encountering the island's colourful species on land and beneath the sea. 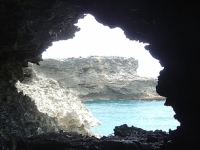 Ocean lovers should head north to the Animal Flower Cave. Located in the rugged parish of St Lucy, it's home to vibrant sea-anemones. Some of its pools are deep enough to swim in. The Folkestone Marine Park is a must for Scuba divers. Situated in St James, its artificial reef was created by deliberately sinking the Greek ship, Stavronikita, in 1976. Snorkelers can admire corals, sponges and marine species in the park's Recreational Zone. The park also has a museum and an aquarium. The Barbados Wildlife Reserve is mainly a monkey sanctuary. Set in a natural mahogany wood in the parish of St Peter, its Green monkeys are hugely entertaining as they play in their natural environment. Birds, ducks, deer, peacocks, otters, raccoons, turtles and tortoises also roam in the woods.